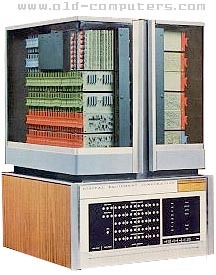 The PDP-8 was the first sucessful commercial minicomputer, produced by DEC in the 60s, the first real minicomputer, and the first computer costing less than $20,000. By late 1973 to 77, the PDP-8 family was the best selling computer in the world. The basic version could sit on a desktop rather than requiring cumbersome racks well known at the time. This compact size caused it to become a popular system in scientific laboratories. The machine had a now quite strange 12-bit word and four thousand 12-bit words of magnetic core memory. The first model was built without any Integrated circuit - thus no microprocessor - but with discrete transistors mounted on numerous small printed circuit boards called 'flip chips' that were inserted on two backplanes mounted vertically. Both table-top and rack-mount models were available, but adding additional memory required a rack. CPU was composed of 12 interlinked Register Boards each operating on one bit slice of the 12 bit word and containing an Adder function together with all the major registers - MB, MA, AC, PC. Speed a little less than 1MHz. The instructions set of the PDP-8 was very limited, only eight basic instructions encoded by the three left bits of each 12-bit word, and one register, the accumulator: However, the PDP-8 could be programmed to do almost anything. It just took longer (sometimes very longer!) to execute programs. A 110 baud current loop teletype interface allowed an ASR 33 Teletype to be connected, serving as a console as well as a storage device by means of the built-in papertape puncher and reader. All together, about 50,000 PDP-8 series computers were sold, as well as numerous clones made USA, Asia and East European countries. In 2000 year, there were still a few PDP8's in operation, mainly in third-world countries. SIZE / WEIGHT 48 (W) x 55 (D) x 84 (H) cm. / 150 Kgs. see more Digital Equipment Corporation PDP-8 Ebay auctions !